Rallies took place all over the country on Sunday to mark the 33rd anniversary of the landmark Roe v. Wade court decision legalizing abortion. In Minnesota, the state's leading group opposing abortion convened at the Capitol for what it called its biggest rally ever. Abortion rights supporters held their own, separate events later in the evening, including concerts called "Rock for Roe." But the gathering at the Capitol was a show of political force for abortion opponents. And it provided a snapshot of their political ascendancy in the state right now. St. Paul, Minn. — The Minnesota Citizens Concerned for Life estimated attendance at their rally exceeded 6,000 people. As bagpipes droned in the background, abortion opponents circled round the Capitol's front lawn. Signs listing town names like South St. Paul and Albany announced where the marchers hailed from, and other placards reading "Stop Abortion Now" made it clear why they were there. Pam Abbate, the Minnesota Citizens Concerned for Life's spokesperson, told the crowd that the number of abortions in Minnesota has fallen to record low levels. "The pro-life movement is in the fast lane, making gains and saving lives. I personally think in my lifetime, Roe v. Wade will be overturned," she said. Abbate sounded a hopeful note about some recent Supreme Court appointments. Chief Justice John Roberts has already been confirmed, and Samuel Alito is expected to be confirmed this week. Both men have ambiguous positions on abortion. Abbate went on to outline an ambitious legislative agenda for Minnesota in 2006. She said her group will push for laws limiting the use of tax dollars to fund abortions. They'll promote a bill requiring abortion providers to give hospital admitting privileges to women in the event of complications. And they'll seek more stringent oversight of the judicial bypass option in Minnesota's parental notification law. "The bypass allows abortionists to take minors to a judge and get a court order for a judge. We want to know how often this bypass is being used," she said. There's strong support in the Minnesota Legislature for bills limiting the scope of abortion rights. Two thirds of the state's House representatives oppose abortion, as do a majority of state senators. Republican Gov. Tim Pawlenty has signed significant pieces of legislation limiting abortion rights. Those include a law requiring a 24-hour waiting period for abortions, and another which funds programs helping women carry their pregnancies to term. 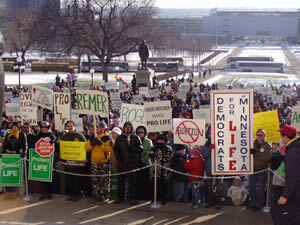 And Pawlenty has instituted a "sanctity of human life day," to coincide with the anniversary of Roe v. Wade. "I hope that you're proud to be from a state that officially declares human life as precious, and that it should be protected. As long as I am governor of the state of Minnesota, we will proclaim this day every as sanctity of life day in Minnesota," he said. On the whole, none of this sat too well with abortion rights supporter Tim Stanley, director of government and public affairs for Planned Parenthood of Minnesota, North Dakota, and South Dakota. And he's well aware of the clout abortion opponents hold in the state. "To be honest with you, given the agenda that they've put forward, we will be in the defensive position, because they have the numbers at the Legislature to be very competitive on anything they want to initiate," he said. Stanley says that balance of power is changing incrementally. He points to some House seats won by abortion rights supporters in the in the 2004 election, as well as two Senate seats recently won through special elections. "I think that our momentum right now should be a cautionary tale to the anti-choice community to not overplay their hand and this agenda they've put forth, to be frank, if they really initiate that agenda, I believe they will be overplaying their hand, and we will come back at the ballot box in November and be successful," Stanley said. In the meantime Stanley is hoping for success with his group's agenda for this legislative session: he says they'll push for better education and resources to prevent unwanted pregnancies altogether.